In this recipe, you will learn how to merge different workspaces each other with 3DF Zephyr. This tutorial can be performed only with 3DF Zephyr Pro version (1.100 or higher). It often occurs that there is the need to split an entire picture dataset into several workspaces, for instance, due to its considerable size. Starting from 3DF Zephyr 1.100 it is possible to exploit the new import workspace tool, that allows merging different .zep files into one common workspace. Nearby cameras (only in Zephyr Aerial): click on Import > Import and merge another workspace to open the Import window where you just select the project you want to merge and click the Import button. If no control points are placed in the projects Zephyr will automatically select Use the nearby camera’s option. 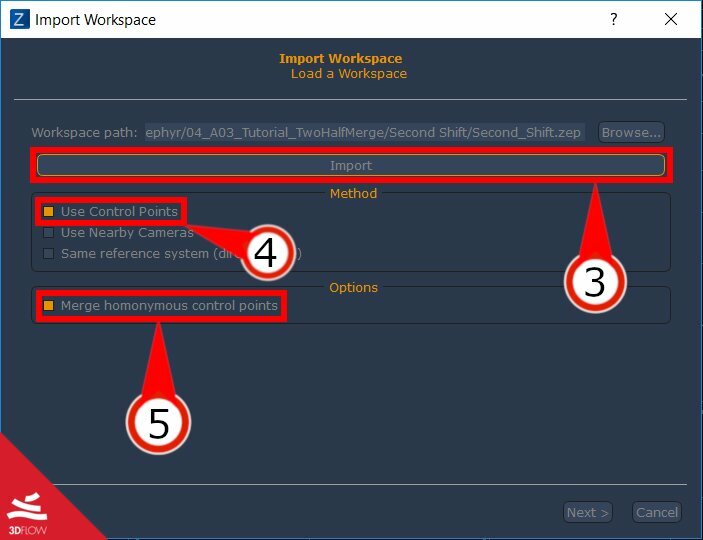 Control points: after clicking on Import > Import and merge another workspace you will see the Import window. 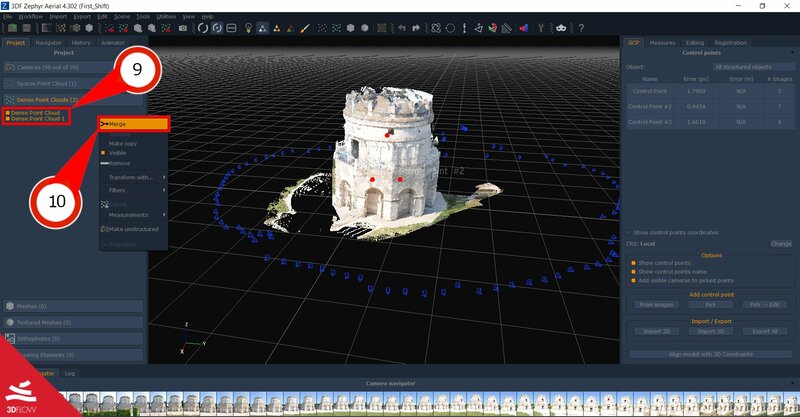 It is necessary to place at least three control points on each point cloud of the projects before running this procedure. Control points must have the same position and the same name to allow Zephyr to find matches between them and proceed to the merge. It is recommended to keep the Compute Bundle Adjustment option active so as to further optimize the merge process. This tutorial is about control point merging. Firstly, it is necessary to place at least 3 control points on the model before starting workspace merging (check Tutorial #2 for any doubt). 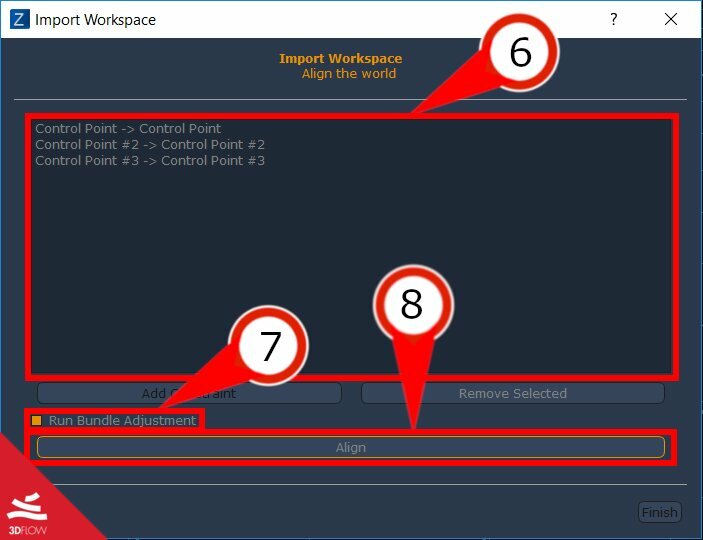 Control points have to keep the same name and position in both workspaces, so a common captured area should be considered while splitting a dataset. Remember that this tutorial is meant to be mainly used for dense point clouds. In this particular case, the aim is to merge one side of a building with its other one. Once reached the dense point cloud step in both building sides workspaces – each one provided with at least 3 control points – you can choose any of them and simply click on “Import” (1), then on “Import and merge another workspace” (2). Within the workspace loading window, click on “Browse” in order to select the path of the corresponding workspace. After having set up the path, click on “Import” (3) button. Choose merge mode between “Use Control Point” (4), “Use Nearby Camera” or “Same Reference System”. Check “Merge homonymous control points” (5) to allow automatic recognition of control points pair names. As you can see, 3DF Zephyr automatically matches each control point in both the workspaces, reporting them in a list (6). In order to get a better alignment result, you should keep the “Run bundle adjustment” (7) option operative. Indeed 3DF Zephyr performs a raw merge without it, even though more quickly. Click on “Align” (8) button for starting the computation. 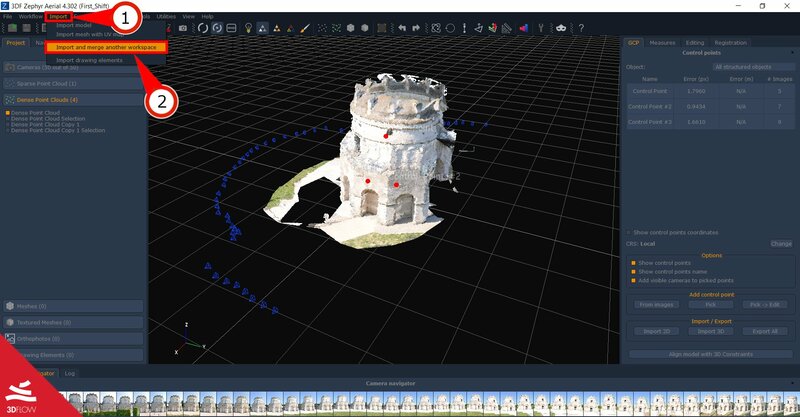 Once the process is finished, you can manually merge the two dense point cloud by selecting both of them (ctrl + left click) (9) and then right-clicking the selection. Then select “Merge” (10) option. The next tutorial will explain the confidence tool. Click here to proceed to the next tutorial.